Yesterday both Luke & I had the day off. 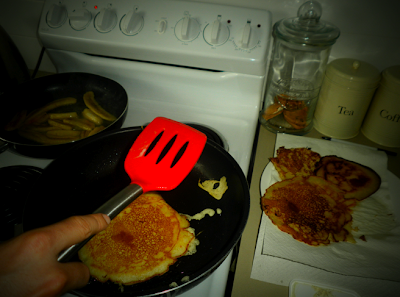 After a good sleep in, Luke made pancakes with pan fried banana, it was the best way to start the day! It was another horrible rainy day, and dvds and cups of tea are good rainy day activities. So we went to the shops and did a grocery shop, perused paper backs, I got some 'every day' perfume, visited the fruit market, purchased our only Christmas decoration and picked up some coffees. On our way home we rented dvds, then came home and had savory pastries and coffee and watched the second Twilight. I never really got into the series or the books, but at the start of the year the first movie was on tv and I watched it and have been meaning to watch the second one all year. Luke & I had every intention to go see the third at the movies this week, but it isn't on tomorrow and that will be the only day we could go together. After Twilight, Luke made a peanut satay stir fry with rice noodles for dinner, and we watched Luke's choice of movie, Eagle. I didn't really pay attention as I was drawing. I love these simple, easy going types of mid-week days. those pancakes look super yummy! I think Luke needs to head over my way and share his cooking skills with me - Pancakes, pan fried bananas, satay stir fry, noodles, cups of tea! You keep hold of him lady!!! It really does sound like a relaxed, perfect, mid-week day! for a better day off! Hannah it was so interesting that it felt like it only went for half an hour. Thats how much of it I watched! At least Luke liked it! I normally would have fussed about his movie choice, but I didn't have a leg to stand on considering I made him watch Twilight AND comment on who was hotter Jacob or Edward!